Description: FLYING Moroccan Monkey. 2 light. 11" deep. 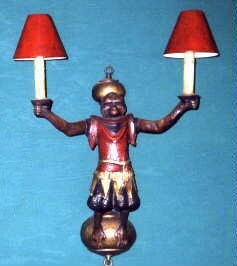 Original monkey flying also available to match chandelier. Takes 60 watt bulbs and has drip candle covers. Resin &steel. Shades extra.